Immediately upon the news of von Laue's discovery there was great interest in the Netherlands in its application to a number of fields. In Groningen there were Jaeger and Haga; the former had a life-long intense interest in Nature's symmetry, and in the crystal world in particular - witness his Principles of Symmetry and its Application in all Natural Sciences (1916) - ; the other had carried out, searching for the nature of X-rays, the well known diffraction experiments of X-rays through a slit. It is therefore not surprising to see them working together in 1913 on the symmetry of Laue diagrams. Jaeger tested experimentally the Laue symmetry for nearly all crystal classes in a series of careful investigations. Nowadays one probably feels such a systematic investigation to be somewhat superfluous. For that reason it is interesting to notice that Jaeger for a short time thought to have to conclude that von Laue's theory was exact for isotropic crystals but that something was lacking in applying it to others. It soon appeared that the small deviations could be explained by wrong adjustments of the specimens. Of these first investigations we mention that as early as 1913 Jaeger developed an apparatus for X-ray exposures at high temperature. Jaeger-Terpstra-Perdok-Hartman and their pupils form a Groningen chemico-crystallographical school. For each school we shall mention its typical fields of study and structure determinations, even if here and further on we shall have to make some rather arbitrary choices. Here we find the structure determinations of the ultramarines with their vagrant atoms; of NaSb(OH)6, whose structure is in agreement with a suggestion of Pauling; attack on the formulation Na2H2Sb2O7 5 aq., which in this customary form brotherly unites the elements pyro and aqua! This school has always kept up the closest ties with the classical geometrical crystallography. Its contribution to The Barker Index of Crystals, and a theory of the relation between external form and internal structure of crystals are examples of it. From the first year after the discovery of X-ray diffraction date the theoretical papers of Lorentz and Debye, which have already been dealt with in this memorial volume (Ch. 5). In 1916 Lorentz delivered three lectures on X-rays and crystal structure, which decided Professor Keesom to start on X-ray work. Already then Keesom, who later solidified helium, had in mind to extend the investigation to low temperatures. At that time he was professor at the Veterinary College in Utrecht - Van 't Hoff too started his career there - and he and his co-worker Dr. Kolkmeyer tackled the first structure determination in the Netherlands. The initial investigations were largely connected with the studies on allotropy of the Utrecht professor of chemistry Ernst Cohen. It is indeed remarkable how great a part was played by allotropy in the first planning of the Dutch X-ray work. There were two professors of chemistry who had strong personal, and sharply opposite views regarding this phenomenon. Cohen at Utrecht wanted to call every substance physically impure, a mixture of different modifications. Smits, in Amsterdam, wanted to assume for every crystal the character of a solid solution, a dynamical equilibrium between different kinds of molecules. Both were eager to see their views confirmed with the aid of X-ray analysis - less willing to modify them according to its results! Close co-operation arose between the X-ray workers of Utrecht (Kolkmeyer) and of Amsterdam (Karssen and Bijvoet, who passed a short apprenticeship in Utrecht) . From this Utrecht-Amsterdam school, orientated mainly chemically, came many X-ray workers. This resulted in a large penetration of the Dutch Universities by X-ray analysts, of whom a considerable number later on as professors, mostly in physical chemistry, remained faithful to their first love. Karssen, who went over to the application of X-ray diffraction to histology, died early. Kolkmeyer had a great liking for time-space symmetry considerations, which he developed extensively after an investigation of bond orbitals in diamond, in which he considered the electrons to move with mutual phase relations. 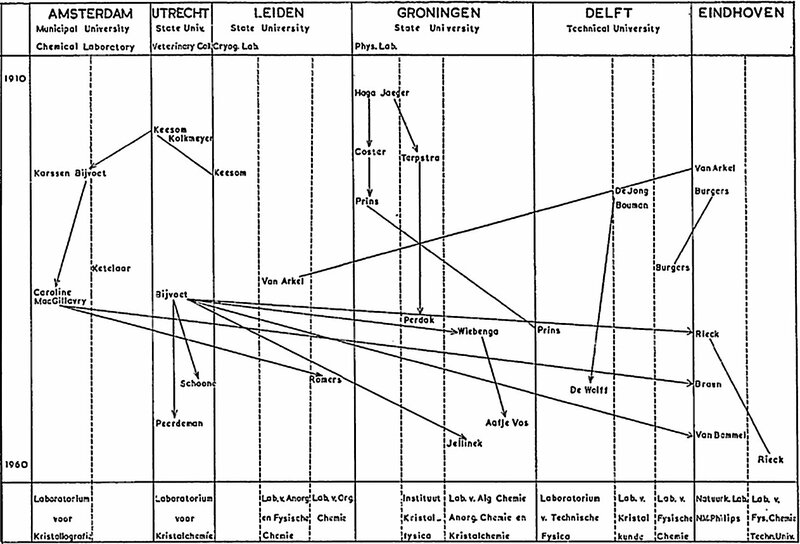 In Amsterdam, as mentioned already, the phenomenon of allotropy predominated in the early days. Studies were made of the crystal structures of red and yellow HgJ2, the transition of which appeared to be brought about by the shift of the Hg-ion from a hole surrounded by 4 atoms to one with (2 + 4) atoms (molecule-formation); disorder was observed in the sequence of the layers in the CdBr2-structure, in the random distribution of the Hg-ions in Hg(NH3)2Cl2 - which makes the X-ray diagram of this compound practically identical to that of the element Ag! - and in rotation-transitions (NaNO3, NaCN). When changing over to organic structures, after Professor Robertson's famous phtalocyanine synthesis, the isomorphous replacement method was successively extended in Utrecht to the more general cases: campher, strychnine, tyrosine. In the last case 'anomalous' scattering was called in for the determination of phases or signs, which settled the old problem of absolute configuration of optically active compounds. Structure determinations of particular chemical interest are those of gamhexane and muscarine, one of great accuracy that of NH4H-tartrate where the standard deviations of the coordinates amount to a few thousands of an Ångström. Professor MacGillavry investigated in Amsterdam, among other things, the cause of the well known alternation in properties of aliphatic dicarboxylic acids, which was shown to be due to the packing of the carboxylic groups. While this leaves the 'even' molecules planar, it induces a twist in the molecules with odd number of carbon atoms. In cooperation with Prof. W. G. Burgers the classical example 'of habit modification, octahedral growth of rocksalt induced by urea, was explained by temporary adsorption of a nucleus of the compound urea-NaCl·H2O on the rocksalt octahedral plane. The nitronium ion NO2+, supposed nitrating agent for aryl compounds, was shown to exist in the solid state of nitrogenpentoxide (N2O5 = NO2+·NO3-) and in some combinations of nitric acid with sulphuric acids. Oxygen compounds of SVI and PV reveal the same structural principles as the silicates: tetrahedra sharing corners form chains, plates, rings and interlocking spiral ramps. Studies on vitamin-A related compounds reveal the influence of steric hindrance on a conjugated bond system. Disorder and twinning were studied in several cases. Out of a seminar grew an interpretation of peculiar diffraction fringes in electron diffraction. It is characteristic for the Laboratory of Professor MacGillavry that many foreigners work there: there were guests from the U.S.A., Canada, Uruguay, Italy and Spain. Needless to say that workers from all Dutch laboratories go regularly to England and U.S.A. The laboratory of Professor Wiebenga, the successor of Professor Jaeger, at Groningen is at present the only centre in the Netherlands where protein structures are investigated (papaine, mol. weight 21000). From this laboratory comes an integrating Weissenberg camera (Wiebenga and Smits) which is widely used. Examples of structure investigation are the determination and interpretation of interhalogens and polyhalogenides - compounds which of old had been the stumbling block for the classical valence theory - and structure determinations of the phosphor sulphides, which with P4S5 and P4S7 led to a chemically unexpected result. X-ray intensities of crystals are measured accurately at low temperature in the hope that the distribution of the valency electrons in molecules can be determined. Dr. Jellinek (muscarine; investigation and systematization of structures related to the NiAs type) has recently found an intriguing effect in the alternating bond length in the sandwich structure of chrome benzene. When writing this survey (June 1961) this effect was still theoretically unexplained. Let us go back to former times. Keesom, returning to Leiden as the successor of Kamerlingh Onnes together with his pupils - among whom Professor De Smedt from Louvain - carried out X-ray investigations at extremely low temperatures including structure determinations of the inert gases. These were experiments that could be performed only in very few places in the world. Röntgenographically the transition to the supra-conducting state in Pb, the difference between the crystals of hydrogen and parahydrogen, between He I and He II were studied without obtaining a revealing answer. After Keesom had resigned, the X-ray work in the Kamerlingh Onnes laboratory was not continued. In Groningen Professor Coster, who already had attained international fame at M. Siegbahn's laboratory in Lund, and his pupil Prins concentrated in the first place on X-ray spectroscopy. Among their results is the remarkable connection found between the fine structure of the absorption edges and the crystal structure of the absorber. Soon they also started diffraction work. Among other things an absorption correction was introduced in the dynamical theory and measurements were made of the effect of anomalous scattering in the reflections from the tetrahedral plane of zincblende in which Friedel's law proved to be violated. The underlying phase shift, known for long in optics, refound in X-ray diffraction, later had to be discovered again for electron waves. Zernike and Prins gave the theory of liquid-diffraction (radial distribution curve); preceded by Ehrenfest's derivation of the diffraction effect in a bi-atomic gas, Keesom and De Smedt, and independently Debye, had pointed out the part played by the intermolecular distances in the liquid diffraction. The basis for this theory was already laid by Ornstein and Zernike in their study of the light scattering by density-fluctuations of a gas at the critical point. After Coster's death and Professor Prins's move to the Technical University at Delft, X-ray research in the physical laboratory at Groningen came to an end. As a matter of course Philips Laboratory at Eindhoven took up the investigation of metals at an early stage, including the study of the deformation and recrystallization phenomena. This was done by Van Arkel. Moreover, by determining a number of simple crystal structures, such as MgF2 and PbJ2, Van Arkel traced the influence of ion radius and polarizability on the lattice type. He became an advocate of the electrostatic bond type, witness also his book, at first written together with J. H. de Boer, Chemische binding als electrostatisch verschijnsel; this book has appeared in several languages, and its several editions describe this field more and more comprisingly. With Verwey he started the investigation of the ferrites, followed by a series of investigations of Verwey and co-workers on the cation distribution in spinel structures, so important both theoretically and technically in view of their magnetic properties. Also for reason of their magnetic properties Braun examined crystal structures of a group of hexagonal compounds of BaO with iron oxides, which are built up of thin layers of spinel structure alternating with layers of another structure. In the meantime Van Arkel had moved to Leiden - he studied here among other subjects the crystal structure of complex oxides and halogenides - and in Eindhoven his metal investigations were continued by W. G. Burgers. Burgers was introduced to X-ray diffraction during the years 1924-1927 as Ramsay Fellow at the Davy-Faraday Research Laboratory under Sir William Bragg. He established there a normal structure for some optically active crystals, the behaviour of which was thought to be caused by a packing of birefringent lamellae. At Philips Laboratory he investigated in particular recrystallization phenomena and lattice transformations. The transformation from hexagonal to cubic zirconium was determined röntgenographically, while with the aid of the electron-emission-microscope the transformation of α- into γ-iron was made directly visible. From this period dates also an optical demonstration method developed to illustrate electron diffraction phenomena. After Burgers' change to the Technical University at Delft the metal investigation at Philips Laboratory was continued by Custers and Rieck. For the last few years the anomalous transmission of X-rays by perfect crystals, the domain initiated by Borrmann and von Laue, has been studied both experimentally and theoretically, and this investigation is continuing. At the Technical University Professor Burgers established the Delft metallographical school (Tiedema, Verbraak). The idea was developed that in many cases the origin of preferred orientation in the recrystallization of metals is due to oriented nucleation by polygonization of lattice-domains deformed in a certain way. In the case of copper also the possibility of a martensitic process of nucleation in the recrystallization was suggested. Continuing Cohen's work the transformation from white to gray tin was again studied and compact crystals of the gray modification were successfully prepared by alloying with mercury. At the Delft Technical University the earliest contributions came from Dr. De Jong, formerly assistant of the late mineralogist Professor Grutterink. De Jong's thesis (1928) described the crystal structure of three sulphide minerals; he also wrote one of the first papers on a focussing powder method (1927). In the middle 30's a close cooperation arose with the theoretician Dr. Bouman. Their joint invention, the retigraph, was the forerunner of Buerger's precession camera and is still being used and further developed for its proper merits. Bouman's later work covers a great variety of aspects of diffraction theory. Some of it was done jointly with younger physicists at the Delft University, e.g. Professor De Wolff who developed a version of the Guinier camera allowing simultaneous exposure of 4 specimens. Professor Prins left Groningen for Wageningen and later on Delft, where he continued some X-ray investigations, especially of liquids and vitrification. He cleared up the interesting allotropy of sulphur and its melt, which, in the heyday of the phase theory, had intrigued a number of Dutch investigators. Finally some places of diffraction work should be mentioned which have not (yet) grown into schools. Professor Goedkoop who specialized in neutron diffraction at Kjeller, is now director of our pile at Petten. Dr. Romers at Leiden is doing more particularly electron diffraction work. As regards industry, besides Philips, diffraction is being used in the laboratories of the Royal Shell Co., initiated by Ir. De Lange who had worked with Professor Robertson in Glasgow; at the State Coal Mines (Dr. Westrik); and at the Royal Dutch Explosive Manufactories (Dr. Trommel). A long series of investigations has been devoted to cellulose at the A.K.U.-Arnhem (Algemene Kunstzijde Unie) (Dr. P. H. Hermans and co-workers). We may regard J. R. Katz as the precursor in our country of this work on fibre structures. In 1925 he made the spectacular discovery that rubber, when stretched, becomes crystalline. Katz was a quite different type of X-ray investigator: a psychiatrist of enormous literary culture, but with an extremely narrow basis of mathematics. He travelled much and published a good deal on the diffraction of liquids and starch, and on the physico-chemical background of why bread grows stale. The Dutch X-ray workers are united in the F.O.M.R.E., Stichting voor Fundamenteel Onderzoek der Materie met Röntgen- en Elektronenstralen (Foundation for Fundamental Research of Matter by X-rays and Electron Rays). This foundation was set up after the war, mainly for the purpose of obtaining more easily money from the Government so as to supplement equipment, which had become quite antiquated. The most important activity nowadays is the yearly scientific meeting. The board of this body also functions as National Committee for the Union of Crystallography. The foundation employs a praeparator, A. Kreuger, who, having grown up with X-ray analysis in Amsterdam from its beginnings, now places his great skill at the disposal of all departments. After a preliminary period in which incidental use was made of I.B.M. accounting machines in crystallographic computations, the computer age was ushered in in 1958 by the installation of a medium-size electronic computer, the ZEBRA (Zeer Eenvoudig Binair Reken Apparaat, very simple binary calculation apparatus), at the Universities of Delft, Groningen and Utrecht, and some other type computers at industrial centres. A very close cooperation between the Universities resulted in a well equiped arsenal of interchangeable programs, preventing any essential duplication. Less intensive but still fruitful contacts are kept with ZEBRA users abroad (Cardiff, Pretoria). Very large computations, such as ultimate refinements including anisotropic temperature factors, are usually carried out abroad (Manchester, Leeds). This survey may be concluded with a very brief summing up of the present centres of X-ray investigation. These are at the Universities of Amsterdam, Utrecht and Groningen, where structure determinations are the main subject, the metallographical school of Burgers at the Technical University at Delft and the Philips Laboratory at Eindhoven. The author wishes to thank Dr. G. A. Bootsma for his help in assembling this survey.